Mantle of the Expert doesn’t use drama to perform for others, to ‘act out’ stories or to role-play scenarios. 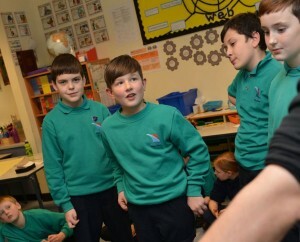 Rather, it uses drama as a means of creating imaginary contexts for learning (dinosaur islands, medieval castles, fairy-tale worlds, Victorian mines), making the curriculum accessible, meaningful and engaging for students. Drama media — theatre, film and television — uses a range of dramatic conventions in various forms. Some are simple, like the voice-over in Blade Runner, giving us access to the main character’s thoughts and emotions. Others are more sophisticated, such as Scrooge’s door-knocker that comes to life as Marley’s ghost and gives us a premonition of things to come. In Mantle of the Expert, dramatic conventions (there are thirty-three in all) are used to create opportunities for students to explore and analyse events and to investigate people’s thoughts, actions, and values from multiple points of view. They allow time to be stopped, jumped and, if necessary, rewound and replayed in order to create opportunities for students to try out ideas, discuss alternatives and experience decision-making and responsibility. Drama provides added dimensions to learning in the classroom and creates opportunities to get inside the curriculum: stepping into fictional worlds, imagining life in the past and engaging with people from history and literature. A class studying the Roman invasions, for example, might imagine being part of the Iceni revolt and have to decide what to do with Boudicca’s body when their village is surrounded by the Roman army (as in this video working with a class of year 3s). How should they act? She is their Queen and they know what the Romans do to the bodies of their defeated enemies. But, if they don’t hand her over and the Romans find out, it will mean certain death for them all. (You can find the planning for this here). Although the situation is fictional and we have no evidence it ever really happened, it still has the coherence and authenticity of a real historical event. The children have to think their way out of the dilemma. It feels real to them; it bothers them, makes them want to understand and appreciate what it was like to be those people, at that time, in that place – their homes raided, their weapons confiscated, their culture and heritage destroyed. This is the stuff of history, the human dimension, and the links we have to the past. We can teach students about events, people and dates, but what does it really mean to them? Reading or hearing about the Roman invasions is one thing; being involved as if you were there and making decisions in the face of terrible danger, is quite another. Drama can do this – it can put students in the middle of the action and give them a sense of what it was like to be alive at that time. Used skilfully, with care and a focus on learning, it can create challenging and dynamic opportunities for students to use and apply their knowledge and to develop a formative understanding of people, ideas, and events.